The tomes of history are rich with strong characters whose actions influenced the future of nations, entire civilizations and even the course of world events. Much of known history is written by the winners, some accounts are retold by survivors of that same happening and some events are documented by independent observers who have no axe to grind concerning the facts or truth of those events. Often the perspective or alleged truth depends upon the teller of that history and many times there are gaps in what gets told. These gaps are fertile grounds for an author of fiction to create his own version of the story. For centuries, the Tsars of Russia had pushed their border southward into the Turkic lands. Their invasion vanguard usually consisted of freebooting Cossaks who lived in stockade villages along the frontier and raided their Muslim neighbors by horseback or by sea. Eventually, after many rebellions by the freedom loving Cossacks against their own Tsars, the Russian army quartered soldiers in each frontier village, made these Cossacks into subordinate military units and launched their own massive spring campaigns into Chechnya to subjugate the various hill tribes. 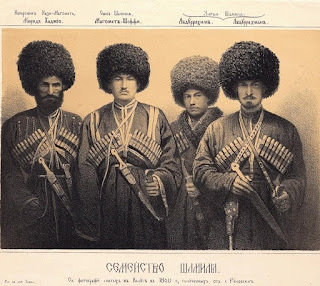 One of the opposition leaders was an Imam named Shamyl who led a group of religious Chechens and Daghestans known as Murids in the northern Caucasus. At one point, the Russians offered to broker a peace treaty with the Murids. In order to guarantee the safety of the Russian negotiators, Shamyl was forced to give up one of his sons as a temporary hostage. The Russians, acting in bad faith, promptly whisked the young boy off to Moscow, Russianized him over the years and made him a cavalry officer in one of their units. During the summer of 1854, Shamyl put a plan in motion to recover his now grown son. On the morning of July 4th, a detachment of Murid horsemen clattered into the Tsinandali palace courtyard of King George XII, the last king of Georgia and an ally of the Tsar. They seized the two princesses, their children and their governesses. The women were tied to the horsemen's saddle frames and the small children were stuffed into large saddlebags. In short time, the entire group rode into the mountains headed for the Great Aul, a mountain fortress in the heart of Daghestan. 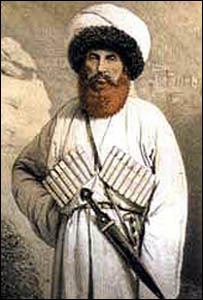 Imam Shamyl had plans to trade the hostages for his son Jamal al-Din (various spellings depending upon the source). As a matter of history, the trade did take place, but there is a gap in the details.. Constantly researching for more Russian history on their invasion of the Caucusus to use as story background, this event is a great find for me. I already have two story characters, the Armenian and his helper the Little Nogai Boy, trading goods with the Cossacks on the Terek River and with the Chechens south into the Wild Country. Since the Armenian is already trusted by people on both sides of the river (as shown in previous stories), who better to act as intermediary for the exchange of the hostages? These two fictional characters can fill the existing gap and write their own story as to their part in what happened. It's now time to invoke the writer's famous What if...clause. What if the Armenian and the Little Nogai Boy are crossing a shallow river deep in the Wild Country when the raiders fleeing with their prisoners happen upon them? The young orphan boy, from the Nogai split out of the Great Mongol Horde after the death of Genghis Khan, tells "The Great Aul" story as he sees these hostage events through his own eyes. Using the young boy as the Point of View also allows for a more emotional impact upon the reader at the end. So let's get down to the bare bones. Our two protagonists, all their trade goods, plus their string of pack animals are taken by the Murids and are forced to travel along with the hostages to The Great Aul high up on a mountain top. Here, the Armenian is offered freedom for himself and his helper if the Armenian takes a letter from the Imam to the Tsar, offering the Georgian hostages in exchange for his son Jamal. However, the Nogai boy must stay behind to ensure the Armenian's return. It's a long trip to Moscow and back. Many things can happen to the Armenian along the route and the boy doesn't know if his master will even return to get him out of the aul. To pass time, the boy starts selling their trade goods in the local market and making his own plans for escape just in case things don't work out according to the plans of others. But, he has to be careful in his actions because he is closely watched by one of the Murids assigned to guard him, a Murid who has lost his entire family to earlier Russian incursions. Plus, it seems not all Murids are happy to have outsiders on the inside of their fortress. Sorry, but that's all you get here. To find out what becomes of our young orphan after the Imam's son is returned, you'll have to read the story yourself. If you are female, you might want to have a tissue handy. It allegedly made the editor cry. As I was trying to decide what to write for today, it dawned on me that some of the columns I have enjoyed the most by my fellow Sayers of Sleuth were those that revealed the "story behind the story" for certain pieces of their fiction. In fact I've always been interested in behind-the-scenes, how-I-do-it peeks into the processes writers use to come up with their creations. So, to make a long story short (pun intended), I'm going to try to do some of that today. In November 2011, not long after SleuthSayers began, I posted a column called "Stranded." In it I mentioned one of my short mystery stories, "Turnabout," that had recently been published in The Strand Magazine. 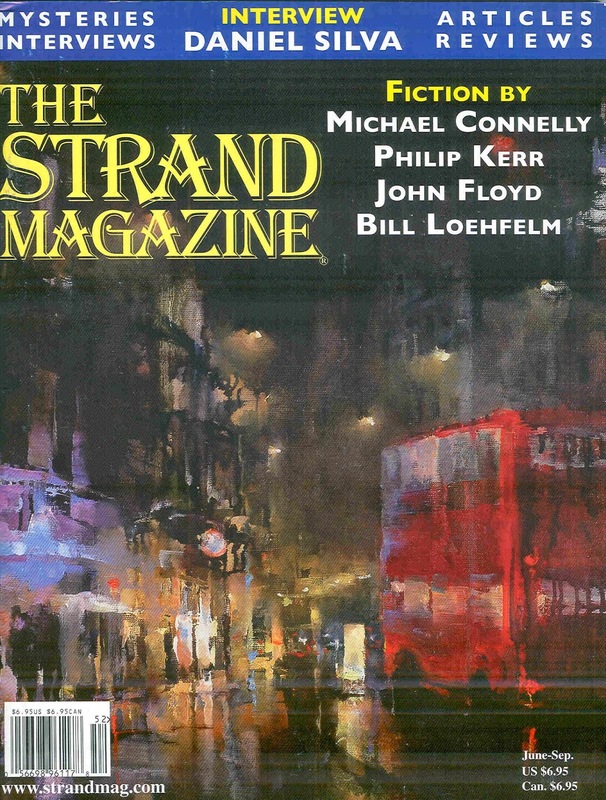 Since then, I've been fortunate enough to have five more stories in The Strand; the latest, called "Molly's Plan," appears in the current issue (June - September 2014). Down here in the Southern hinterlands, I saw a copy of this issue for the first time at our local Barnes & Noble this past weekend, and bought one for me and one for my mother (my Biggest Fan). The glimmer of an idea for "Molly's Plan" began long ago, when I worked for IBM. My job title for many years was Finance Industry Specialist, which sounds more important than it really was; what I did was work with IBM banking software applications, like teller networks, ATMs, check processing systems, etc., which required me to spend most of my time with clients at their business sites. For me, those sites--or work locations, if you want to call them that--were banks. One of the zillions of financial institutions I visited in the course of my career was a big gray lump of a building with white columns along the front, at the end of a narrow street that was always jammed with traffic. It was a branch of a regional bank, but it looked more like the fusion of a plantation home and a medieval prison. Even its layout was strange: it offered very few parking spaces, no drive-up windows, and limited access in just about every way. Simply stated, it was hard to get to and hard to leave. Because of this--and because my devious mind leaned toward deviousness even back then--it occurred to me that this bank would be extremely difficult to rob. Or at least difficult to escape from, after being robbed. I mentioned that to the branch manager one day, who confirmed my observation. He told me there had never ever been a robbery there, not even so much as an attempt, and probably never would be. As I later noted in the short story that resulted from all this, "Smart rustlers tend to avoid box canyons." The manager was so confident he didn't even bother to have a rent-a-cop on guard duty. Bottom line is, my impressions and memories of that real-life location formed, years later, the setting for my story. As you might suspect by now, the plan in "Molly's Plan" was to steal a fortune in cash from the vault of this bank, and get away with it. The only other thing I might mention about the story is that, unlike most of my mysteries, this one includes a lot of different points of view. One scene is from the POV of an unnamed narrator, several are from the bank robber, others are from his wife, from a police officer, from a teller, etc. That's a lot of POV switches, for a story of around 5000 words. Most of my short mystery stories, certainly most of the ten that have so far appeared in The Strand, have only one POV--that of the main character. So why are there so many points of view, in this story? The answer is simple: I felt it would take that many to properly tell the tale. In this case, I wanted to introduce suspense on several levels, and even though I understand the advantages and intimacy of the first-person and third-person-limited points of view, the one big advantage of third-person-multiple POV is that it allows the writer to build suspense and misdirection in ways that are not possible otherwise. Handled correctly, it can be a win/win situation: the writer can conceal certain facts from the reader by revealing only what a particular character sees and knows at a particular time--and the reader, by seeing the action through the eyes of several different characters over the course of the story, can know things about the plotline that the other characters might not yet know. Maybe there's a burglar hiding in Jane's basement, or the money John found under the park bench belongs to the mafia, or the friendly neighborhood cop is actually one of the killers. Or--as Alfred Hitchcock once said in an interview--oh my God, there's a bomb under the table! Does that approach work, in this instance? I hope so. All a writer can do is try to sell the editor or publisher on his story, and then trust that if it's accepted the reader will enjoy it as well. Do you, as writers, find yourselves calling on personal experiences to come up with most of your fictional settings? If so, how close do you come to the real thing? Do you think that kind of familiarity is necessary, or do you let your imagination supply most of what you need? How much detail do you include? What type of POV do you use most, in your fiction? Does it depend on the form--flash, short, novella-length, novel-length? Or does it depend mostly (as in my case) on the plot? I once heard someone say that your choice of POV should be dictated by how much you want your reader to know and how soon you want your reader to know it. Have any of you tried submitting to The Strand? If you've not sent them something, I hope you will. They publish three issues a year with four or five stories in each, and their guidelines say they prefer hardcopy submissions of 2000 to 6000 words. (All of mine so far, I think, have been between 4000 and 5000.) Contact information: Andrew Gulli, The Strand Magazine, P.O. Box 1418, Birmingham, MI 48012-1418. And here's a link to their web site. Try them out--it's a darn good publication, with a great editor. As for me, I hope to be Stranded again someday. One never knows. In novels and movies, the story usually ceases right after the climax. We, the audience, feel good or bad depending upon how the story ended for the protagonist, antagonist or minor characters whom we've grown attached to, but that's the last we know of them. Unless there's a sequel, we seldom get a look into what happened afterward. Sure, in the fairy tale, the Prince woke up Snow White with a kiss which earned him a luscious lady and we're told they lived happily ever after. End of story. But, when you think about it, this independent bachelor suddenly acquired spousal duties, plus immediately inherited seven little people, at least one of whom was Grumpy. You can't tell me those two love birds didn't have a squabble or two. That's the after story, that's reality. Occasionally, a movie such as American Graffiti or Animal House provides some after-story notes to let the audience know what eventually happened to their characters beyond the climax. After all, inquiring minds have an attachment to the characters they became emotionally involved with and they want to know how those characters ended up much later. So, here's one of my street stories of how the deal went down. Bennie dealt in kilos and had two Green Cards who brought him the coke in from California. In turn, the two Green Cards obtained their high quality product from family members in an area one of the larger Mexican cartels called home. Our boy Bennie was no virgin to the world of crime, seeing as he had two priors for homicide. He'd also been a member of a radical group. Not the kind of guy you'd invite over to the house for Sunday dinner. Slim, a guy with one foot in the outlaw world, had managed to put Bennie and me together for a meet in a hotel at the other end of the state. Bennie was bringing coke to the table and I was bringing thousands of dollars in US currency. Everybody expected to leave the hotel room happy,...except I got to the room first. The local police techs installed a video camera in the air duct high up in the wall overlooking most of the room. Naturally, on the other side of the wall in their own room they had set up monitors to keep track of what was going on in the buy room. They also placed a tape recorder underneath the plastic liner in a waste basket located next to the coffee table in the buy room. Then, in a room across the hall waited a SWAT team on standby to make the arrest. After all, Bennie did fall into the deadly and dangerous category. All equipment worked, everyone in place, our side was ready. The phone rang. Slim, our informant, said the four of them were downstairs. When I inquired about guns, he replied that he hadn't seen any, but they did have the stuff. I said to bring them on up. A knock at the door. I opened it. Slim made introductions as each man filed in. Since the two Green Cards had a little trouble with English, Bennie did most of the talking at first. They brought in and set a large ice chest on the coffee table. To anyone else, it would appear that we were about to have drinks. Being as this was the first time Bennie had ever seen me, he acted a bit standoffish. To make him more comfortable, I took the stacks of money out from under the couch cushions where I'd been sitting and placed said currency on the coffee table. Nothing like lots of high denomination bills to make people talkative. The two Green Cards dropped to their knees and started counting in Spanish, right next to the concealed tape recorder. At this point, I'm talking to the two Green Cards, asking how often we can do this and how much quantity can they deliver. My talking keeps interrupting their counting. Finally, Bennie, being a more efficient type guy plus feeling left out of the conversation, tells Paco to give him the money to count. Paco should open the ice chest and give me the coke. Paco and Green Card #2 open the chest lid, take out the beer and pop, and then start pouring the ice and water into the nearby waste basket beside the coffee table. I can mentally hear a large gasp from the cops monitoring us from the next room. I wait to see if smoke is going to start coming up from a suddenly shorted-out recorder. No smoke appears, the plastic liner must be holding. Using a screwdriver, Paco dismantles the ice chest and hands me two large plastic bags of white powder that had been concealed in the walls of the chest. One bag has a small hole covered with Scotch Tape. Bennie finally admits they sampled the coke earlier to make sure it was good. But of course. While Bennie and the Green Cards go back to counting money, I speak the bust signal and Slim opens the door. SWAT floods the room. Bennie is truly hurt that he doesn't get to keep the money. Some of it is still possessively clutched in one hand when SWAT stretches him out on the carpet. End of story, the deal is done, the bad guys caught, all is as it should be. But, since this is reality, there is an after story, a what happened later. Slim eventually dropped off the radar. Not a bad idea considering his work for us, even if he did have a girlfriend who carried two concealed automatics under her shirt to protect his back. At some point later, Slim and his pistol-packing girlfriend acquired an exotic dancer to round out their little family. I didn't ask, but they probably figured an exotic dancer was more fun than having seven little guys running around underfoot. Seems everybody has different ideas on what they want in life. Paco, one of those happy-go-lucky type of guys, flipped, so we brought in a translator to help with the debriefing. I'd ask a question, then he and the translator would chat for several minutes before I got a simple answer. At one point, he tried telling me his source was a guy he barely knew who recently got killed in a train wreck. I pretended to study my debriefing notes and then told him in Spanish that he was lying and any sentencing deal was off. Surprised and not knowing how much Spanish I really knew (not much), he immediately changed his story about the source. Paco did his time and then got deported. I had grown slightly fond of the rascal and often wondered if he lived after going back to Mexico. Them boys down there didn't care much for people who talked to the law. But knowing Paco the way I did, I figured he probably jumped the fence the very next night so he could return to his favorite California bar in order to play guitar, drink tequila and eat shrimp. In which case, I hope he got out of the coke business. Bennie took his fall and went to Super Max. Ten years later, I'm standing in the lobby of the federal building when I hear this well-modulated voice. "Robert, good to see you." And there's Bennie waiting to get through the security line. "I always liked you," he said. "I have no hard feelings." Well, that's damn good, cuz now Bennie is obviously back on the street. Seems he got good time in the joint and is now headed upstairs to report in to his federal Parole Officer. Bennie assures me he has changed his life. I wish him well. After he goes up in the elevator, I tell the two lobby guards that Bennie won't last six months on the outside. Sure enough, three months later, his parole is revoked for assault. Somebody ended up lucky, that could have been Bennie's third homicide. As long ago as all that has been, he may be out again. Hope Bennie meant what he said in our last conversation, about the no hard feelings. As for me, I get to continue telling tales of the street on the Sleuthsayers blog. Guess I was the one to draw the happy-ever-after card.